Another version of Sennang gunni podi of mine which is similar to idli podi ,tastes great with idli's n dosa's otherwise as such. The ratio I've given is mild yet tasty. 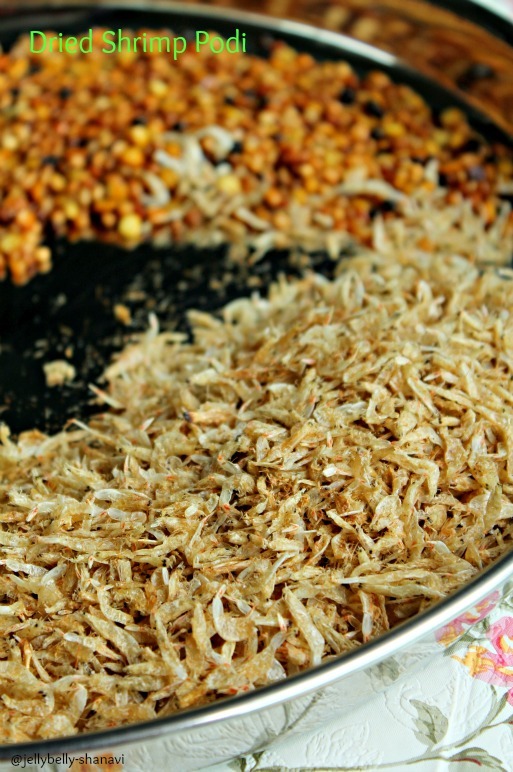 U may add sesame seeds or peanuts to make this podi even more delicious. 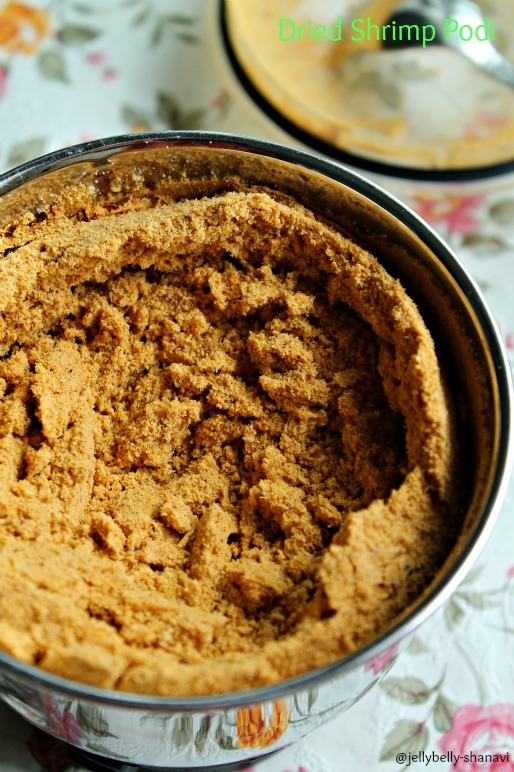 Check out my simple version of the same podi here. Njoy..
Dry red chillies -- 4 nos. Whole peppercorns -- 8 nos. Dry roast the dried shrimp for a minute in medium low flame until it's hot to touch. In the same pan heat a tsp of oil and fry the dry red chillies until crispy and transfer to a plate. Fry the urad dal ,channa dal,peppercorns,garlic in the remaining oil to golden in colour and again transfer them to the plate. Let the fried ingredients cool for few minutes. Add the dry red chillies followed by urad,channa dal and peppercorns and grind (whip) them to coarse powder. Add the salt ,kopparai/shredded coconut and grind them. 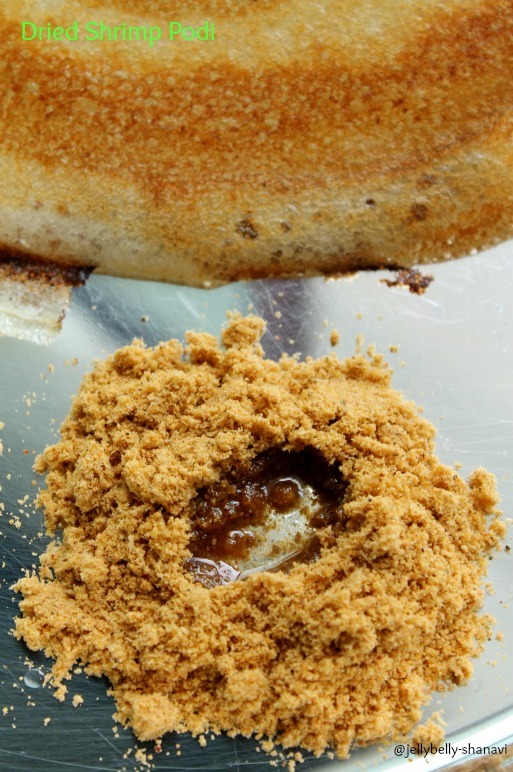 Finally throw in the toasted dried shrimp and grind verything together to idli podi texture. Serve with idli's / dosa's..also for curd rice. I miss dried shrimp.. hubby does not like the smell so don't make it :( I want some now! awww am drooling over here. would love to have some with white rice. yummy! New to me,flavorful podi,can imagine the flavor and taste. Makes me nostalgic, one of my grandma's signature dish,love this anytime. super handy podi..Love the smell and nice click too.